For your next formal Scottish occasion, do not go without the Red Gem Cross-Hatch Sgian Dubh! 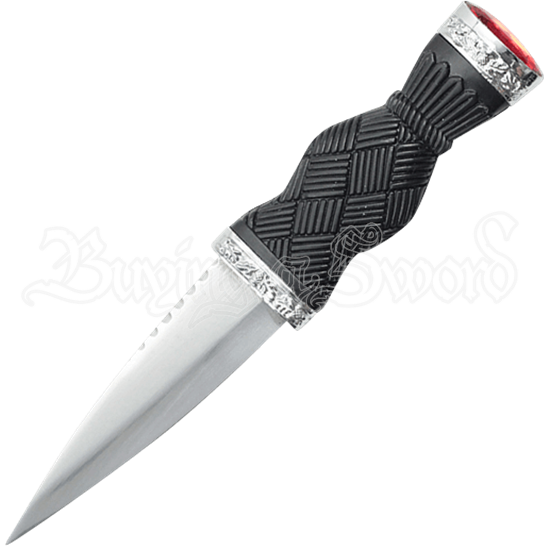 This stainless steel Scottish blade is fashioned after the traditional Highlander dagger, with a regal gemstone inset within its flat pommel. This oval shaped, deep red gemstone is encased within a silvery band that is patterned with ornate Scottish thistle leaves. A matching band accents the top of the cross hatch textured, black composite grip. Made of stainless steel, the spear point sgian dubh blade displays light serrations along its back, lending a sense of utility to this replica Highlander dagger. The matching black composite sheath is included. Ideal for reenactors looking for a dirk with a bit more flair or for collectors of historic weaponry, the Red Gem Cross-Hatch Sgian Dubh presents a remarkable take on the historic Celtic blade.